Hi, I am interested in your 1985 Jeep CJ 7 (stock #4641-ATL) listed on Autotrader for $27,995. I'd like to get more information about this vehicle and confirm its availability. 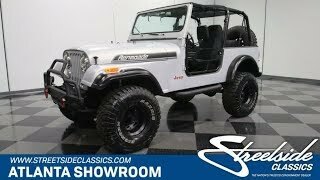 Given how quickly they move through our showroom, Jeeps like this 1985 CJ7 Renegade are finally getting respect from collectors as well as from folks who still understand that theres no better off-road machine than this. Nicely refinished with a lot of new components, this is a trail-ready 4x4 with a lot to offer, including a reasonable price. The matte gray paint is a lot nicer than what it was wearing originally, and the sinister flat finish looks great on the upright Jeep bodywork. Its a few years old and this is a Jeep, after all, so its not perfect, but for a vehicle ostensibly designed to chase through the mud, its about as nice as it gets. Black accents play off the matte gray wonderfully, capped off by the Renegade decals on the hood, and a splash of red on the Jeep emblems and bumper hooks add a nice contrast. A heavy-duty front bumper with flanking LED lights gets you out of trouble, tubular side steps make it easier to climb aboard, and theres a giant tire carrier out back with a full-size spare. Youll also note heavy-duty fender flares to cover the oversized rubber and a minimum of frills; no cheesy graphics or 70s murals here. Few Jeeps are this nicely equipped, this well-finished, and this thoughtfully built. The interior is the familiar low-maintenance Jeep stuff that youve come to expect. The high-back buckets wear neoprene seat covers, a material that wears like iron and you can just hose it off after a day playing in the mud. The floors are covered with spray-on bedliner material with heavy-duty rubber mats, and the back seat looks like its never been used. The dash features clean knobs and handles, a correct speedometer, and auxiliary gauges for fuel, oil pressure, temperature, along with a steering column-mounted tachometer. Youll also note that this Jeep sports aftermarket A/C as well as an upgraded stereo that powers loud speakers for entertainment, and theres a locking center console for a bit of security. Overhead theres a robust YJ-style roll cage as well as a bikini-top and tube doors that provided added safety. Jeeps rugged and reliable 258 cubic inch inline-6 is the engine most CJs use and its a great choice. Torquey and willing to just crawl along at little more than idle speed, it was built for situations just like this. Its mostly original and runs great, thanks to a correct 2-barrel carburetor and HEI ignition components. Its not built to win a beauty contest, but its highly functional and doesnt need any excuses. It has power front disc brakes and power steering for a modern ride experience, and an upgraded exhaust system gives it a cool soundtrack. A quick-shifting 5-speed manual transmission feeds a 2-speed transfer case, and the suspension lift makes it a lot more capable in the rough. Custom black wheels look butch and carry oversized 33x12.50-15 Maxxis Bighorn white-letter radials that look like they can handle anything. The Jeep always looks like its ready for an adventure and this one has a lot of money recently invested in keeping that spirit alive. These machines still represent a ton of fun for the money. Call today!